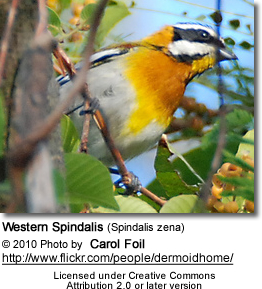 The Western Spindalis (Spindalis zena), also misleadingly called Stripe-headed Tanager, is part of the genus Spindalis. 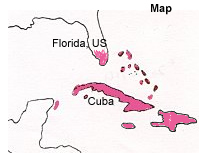 The Western Spindalis can be found in Florida in the United States, Cuba, Bahamas, Cayman Islands, the Dominican Republic, Haiti, Mexico, Puerto Rico, Turks and Caicos Islands, and possibly Jamaica (please refer to below below distribution map). They are associated with a small mixed flock and are very visible as they move around. 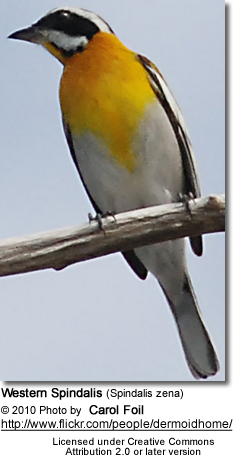 The bird vocalizes with a high, thin "see" while foraging and uses a strong "tsee" when flying. 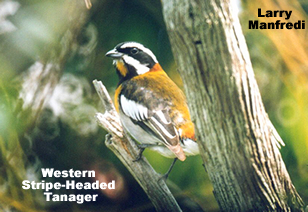 This second vocalization is comparable in strength to nearby Orange-crowned Warblers, but flatter and less metallic. They like to eat fruits, seeds, nectar, flower parts and insects.